Run For Your Life What Happens During a Professional Shoe Fitting? What Happens During a Professional Shoe Fitting? What goes on during a professional shoe fitting? What can you expect? Do you need a professional shoe fitting? Who needs a professional shoe fitting? You, of course! We think you're pretty awesome. Whether you have just started a walking regimen or are training for your next 100 mile race, you need to protect your body by having great equipment. Your feet will thank you later! How much does the fitting cost? It’s FREE! No excuses. Come see us at one of our three locations! When and where can I get my fitting? Whenever we’re open, you are welcome to drop in at any one of our three locations! Come see us in University, Piper Glen, or Midtown and expect to take about 30-60 minutes to complete the fitting depending on your specific needs. Why should I come into the store and get a fitting? When you come into the store, you can talk with employees that have run and walked various distances. Some of us are training for ultramarathons while others walk to stay in shape. We have been exactly where you are in this journey and know what you are going through. When you ask us a question, we can draw from our own experience. Try doing that in Amazon's search bar... "404 ERROR : information not found". When you walk into a Run For Your Life shop, you feel like you are walking into your friend's house. Our store is a place where you can get running gear, of course, but our gear comes with 29 years of experience. 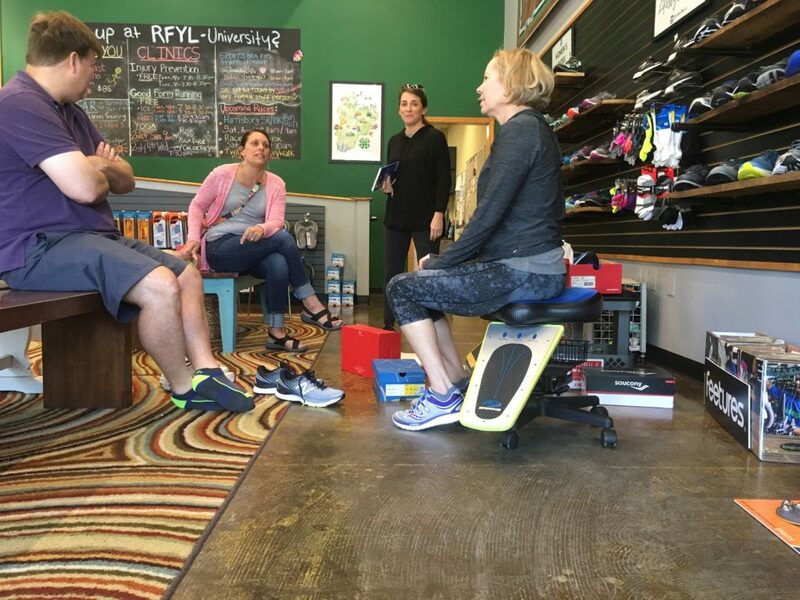 At RFYL, you can come talk to fellow runners about your shared passion. Maybe you didn't know, but you're part of an amazing community. The running/walking community is strong here in the Queen City and it's time that you become a part of it! Come talk with us to help you get started. Now, Let’s Dive In! What Exactly Happens? 1. You walk into the store and you are greeted by one of our smiling sales associates! 2. They’ll sit you in front of our Famous Shoe Wall and tell you all about our shoe fitting process (spoilers ahead)! 3. The associate will let you know that they will be performing a gait analysis, measure your foot, bring out some different shoes to test, and watch you in the shoes. As this is happening, now is your time to ask any other questions you may have about our other products, training, pains, etc. 4. They’ll also want to know about all the super cool things you are currently doing and any goals you are setting. We want to know everything! Really! We want to hear everything! Let us know about races, goals, and injuries (we have a class for that: Injury Prevention Class). Like we were saying earlier one of the biggest benefits of coming into the store is that you get to talk to a real person about what you are going through. 5. Now they will have you take your shoes off and walk around the store and maybe even do a few different style squats. This is for that gait analysis we were talking about. While you are doing this, our associates will be watching to see all kinds of things, including which way your foot rolls (supination vs pronation) and any knee movements you may have. Don’t worry, this is a normal thing. They will tell you what they see and from there we get to the really exciting part! 6. They will bring you some shoes to try! Most likely 3 pairs at first and you can go from there. (They’ll also bring you socks if you forgot your running ones.) If you run in cotton socks, it’s time to read up a little. Check out this article about Cotton Socks vs. Running Socks. 7. As you try out the different shoes, the associate will ask you to walk or jog around the store (or on the treadmill) and outside. This is so you can get a real picture of how they will feel when you are out for your workouts. Again, let the associate know everything you are feeling. They won’t get mad if you need to try on more shoes to find the right one. 8. You found your shoes! You’ve got some awesome new kicks that feel like they were made specifically for your feet. 9. Before you go, checkout some of the apparel and running essentials that we have around the store! Shoes are very important but, as every runner and walker knows, they are just one piece of the puzzle. 9. 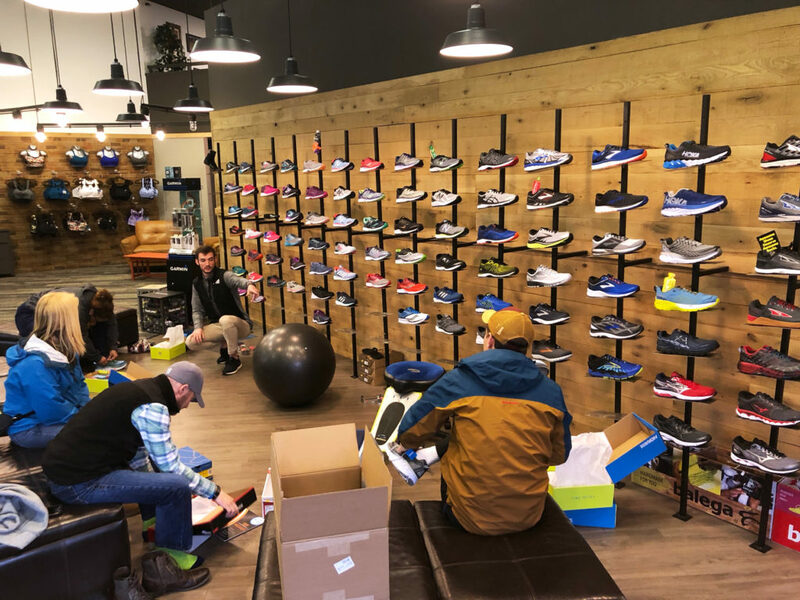 Come back and see us for your next pair (in about 350-450mi) and any of your other running needs. Checkout our Staff Running Tips! We do everything from running 100 meter sprints to 100 mile ultramarathons and we love to talk running!